It’s not a party without color plastic cups. Whether you use them for soda, wine, beer, juice, or good old fashioned water, color plastic cups will be there for thirsty partygoers. Great for birthday parties, holiday parties, graduation parties and everything in between! With an awesome ridge design and a bunch of colors to choose from, you'll never run out of ideas. From Hot Pink to Gold, from Green to Blue, from Red to Brown, we have it all! 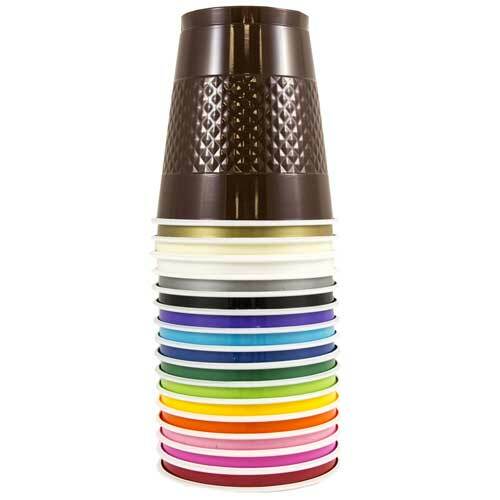 Color Plastic Cups are available in over 15 colors and come in packages of 20. These 12 oz. plastic cups are a perfect fit for canned drinks. Note, the cups are recyclable. They are not dishwasher safe, so hand wash them if you want to reuse! Or just throw them away when you're finished. Be sure to pair color plastic cups with our other colorful partyware options, including: napkins, plates, and tablecovers. Just look under 'Other JAM'n Products You Might Like' and start browsing!